Reed's first official storm chase was at the age of 13, when he intercepted a severe storm in his front yard and was pelted by golf-ball size hail that destroyed his family's video camera. Ever since that day, he's been obsessed with extreme weather and storm chasing. Reed pursued this passion by studying meteorology at the University of Oklahoma. After documenting a massive F5 tornado that struck Moore, Oklahoma, on May 3, 1999, Reed became even more obsessed with extreme storm chasing. Since then, he has driven over 50,000 miles every year from the Mexican Border to Canada, and has captured over 200 tornadoes on film. In addition to storm chasing year-round, Reed is currently working toward a Ph.D. in meteorology at the University of Oklahoma. 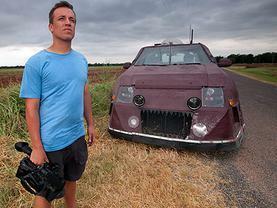 In 2003, Reed started TornadoVideos.net, a company devoted to extreme storm chasing footage and research. During the first season of Storm Chasers, a 300 pound TVN tornado probe was successfully deployed the in the path of a fast-moving twister in Kansas, and captured High Definition video from inside the circulation. During the off-season, Reed took his mission to the next level, and developed an armored research vehicle, the TVN Dominator. Outfitted with a mobile radar, the vehicle was designed to measure vertical winds at the base of tornadoes. This year, Reed has improved The Dominator by adding military-grade Rhino lining to the exterior, and upgrading to half-inch polycarbonate Lexan windows. The shape of the vehicle has also been altered for superior aerodynamics. Enhanced mobile radar and new probe-launching tornado cannons will boost the team's research capabilities. The team is equipped to handle extreme conditions better than ever before.